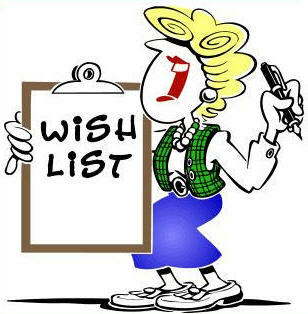 Forget setting New Year’s resolutions; let’s talk about having wishes granted! This weekend I watched a movie, well part of the movie, where the main character was granted 12 wishes to use any way she pleased. Initially she couldn’t believe it, so her first few wishes included things like: wishing someone would send her flowers, wishing for a new pair of shoes; and I think one of her wishes was that her friend could get her hair done before she ran into her ex-boyfriend (smile). After using up the first few wishes on things of that nature and getting them granted, she then went big and wished to win the lottery. Once she’d used up all 12 wishes, she found out the wishes came at a cost (there was a catch – of course), unfortunately, it was around that time I stopped watching (ha!) so I can’t tell you how it ended. Sorry. At any rate, the movie did get me to thinking. I pulled out my journal and jotted down 12 of my wishes. Although some were selfless like: I wished that there were no homeless people and that everyone had a nice place to live; another wish – no hungry children. It makes no since that some of us eat until we have to release the top button on our jeans and have leftovers, while some children barely get a meal a day. Those were a couple of my huge wishes. Then there were those that were a little more selfish: I wish I had a Neatdesk Scanner. I wish I was debt free (of course I was thinking – then I could do more for the homeless and the hungry); but one of my biggest wishes, besides getting a lucrative three book deal/contract with a mainstream publisher, is that I wish Beverly Jenkins and Brenda Jackson would call me up and say that they would like for me to be in a three story anthology with them (contemporary romance or romantic suspense)! One story by each of them and then my story would be between theirs. Ahh, I can see the cover now with all three of our names. Hey, I figure, if you’re going to wish – wish big! So if you were granted 12 wishes, what would your list look like? For years I’ve prided myself on being able to get a lot done in minimum time. I even took on the Army’s old recruiting slogan – “we do more things before 8 a.m. than most people do all day.” That was me, getting an early start to my day to see how much I could get done before 8 a.m. I’ve always considered myself the ultimate multi-tasker, but now I’m wondering if my version of multi-tasking has really been as productive as I’ve thought. I’ve often heard people say – multi-tasking is a myth. In my mind, I wondered how that was possible since I typically take care of several tasks at the same time. If having a load of clothes washing, and a pot of brown rice cooking on the stove while I work on one of my writing assignments is not multi-tasking, then what is? I decided to do some research. It turns out, most of the tasks I do simultaneously are considered “background tasking” according to business coach, Dave Crenshaw. This is when you’re “doing two or more tasks, with only one of them requiring mental effort” like my example above. It’s suggested that instead of trying to do several things at once, give your complete focus to one task at a time. That’s a nice idea…but will I be able to accomplish as much? Hmm…I’m not sure. Now I’m curious. I’m thinking about trying to limit my version of multi-tasking and see how many tasks I can scratch off my daily to-do-list. I have no doubt that this will be super hard for me, especially since I’ve mirrored the Army’s old slogan regarding all I can get done before 8 a.m., for well over 20 years. I also can’t imagine it being as much fun, but we’ll see. 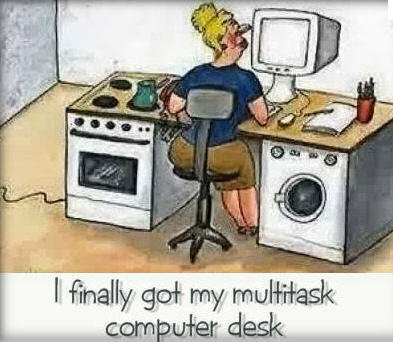 What are your thoughts on multi-tasking?